Transparency plays a significant role for Arela in everything they do. Especially significant, it is in their production chain, which they openly and proudly tell about. The Arela cashmere knits are made in Nepal and China not only because of the talented people but also for social reasons. 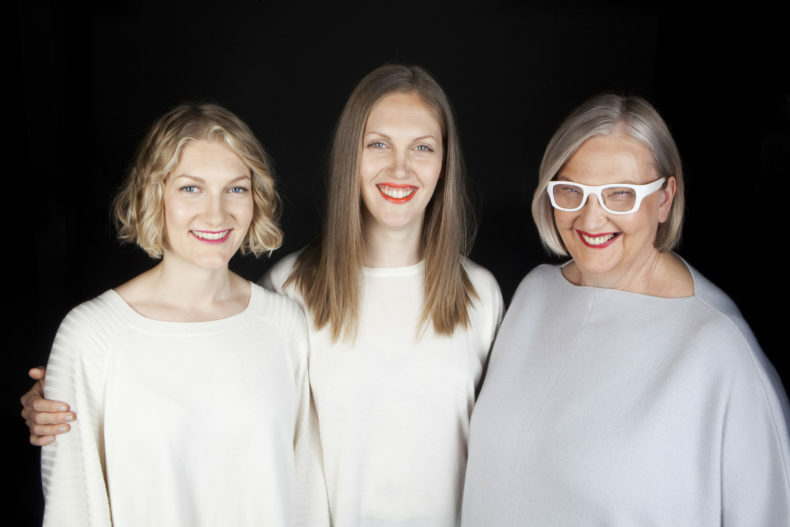 The wonderful three – Viivi, Anni and Maija Arela. Viivi Arela reaches a dark blue thread at her table. She starts to open the triple-twist carefully while explaining that the fibres come from the goats living in the rough plains in Northern China. The natural wool fibre feels silky and light, strong when twisted two to three times. The goat’s wool, grown during winter, is combed off in spring. Then the soft underhair is separated from the rougher wool on top by hand and sorted into different colours. 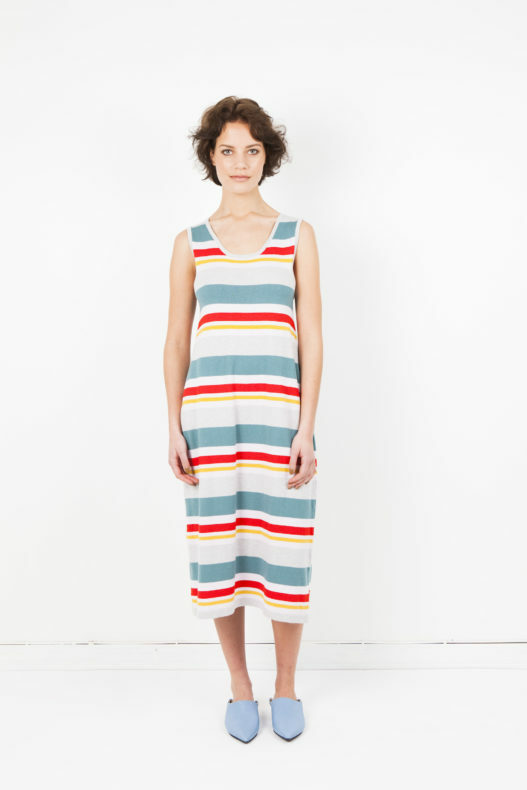 Arela accepts only the long fibres to their knits due to durability and quality. For one sweater, it takes the cashmere of three to four goats’. The yarn is also dyed in China, but the actual cashmere knitwear is produced in Nepal, near Kathmandu. The factory is run by a young woman, employing 80 people, among them are students who earn to pay for their education. The company was chosen years ago not only for the suitable machinery and flexibility but also for their know-how and skills to produce excellent cashmere knits. The factory’s owner does charity for the area’s community too, for example, supports the local children’s education. Anni Arela, the head designer, visits the factory two times a year. 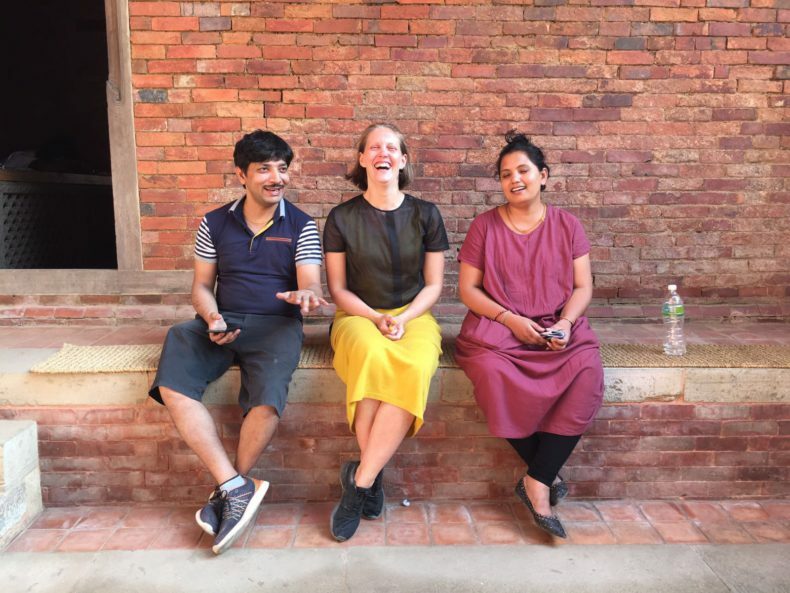 Anni Arela, the head designer, visits the factory in Nepal two times a year. The factory is run by a young woman, employing 80 people, among them are students who earn to pay for their education. “This partnership, built in many years, is also a matter of acting socially responsible. We can do our bit to help their economy to grow, and it would be a huge deal to change our production nearer for the social reasons”, Viivi highlights. In addition, the expertise required in producing Arela’s designs that are sometimes untraditional, can’t easily be found closer to Finland. Viivi twists the blue yarn between her fingers and says again, that the cashmere yarn is so different, soft and fine that it requires special skill both from the employees and specific kind of machines. And a proof of excellence isn’t far. Just a half a meter away, the pilling of two dark blue cashmere knits from the 2008 and 2009 collections are combed and both result in looking brand new. The cashmere yarn is done is China with a long-known partner, whom Maija Arela visits them regularly. A while ago Arela still produced cashmere knits in China as well. They worked with a trustworthy, small factory where the working conditions were fine. But after it was shut down, it has been hard to find a suitable partner who would be ready to produce smaller collections, the minimums there are quite big. Bigger factories would be easier to find, naturally, but Viivi considers that getting to know the owners takes time and then the factory should regularly be visited. Although China’s production was openly discussed, another reason to leave China was the fact that the country is often related with sweatshops and doing things cheaply. The cashmere yarn is still done is China with a long-known partner, and Maija visits them regularly. Arela’s products follow the principles of zero waste, and no rare, expensive cashmere yarn is wasted during the production process. Generally, the cheaper knitwear is produced from a fabric cut to shape and therefore, produces a lot of cutting waste. “Our knits are knitted directly to shape – from a thread to another”, Viivi describes, drawing two threads in the air. Viivi adds that Arela doesn’t compete with price and never pushes the prices below the production costs. It is the only way to keep the business running and to continue producing high-quality products. 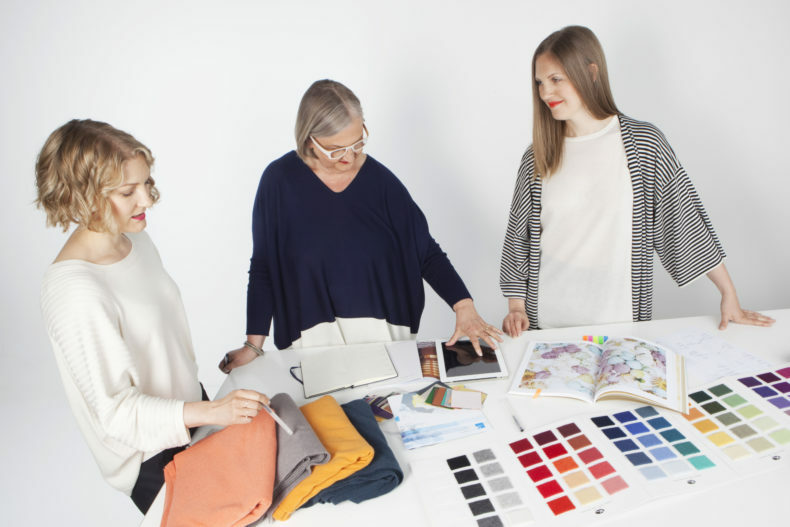 Viivi summarises that their core value is appreciating clothes and the skill and material that goes into producing them. That’s the message Arela wants also to spread. In addition to transparent production, the women of Arela value high taking care of their customers and products even after purchase. The goal of Arela For Good concept is to increase the awareness of clothing materials and maintenance and raise discussion on clothing and consumption choices people make. They, for example, teach about cashmere care and offer care services for the Arela knits. Viivi sees that many medium-sized companies in the clothing industry have also changed their production chain into transparent direction. Or for many, like Arela, transparency and other conscious matters are the core of the company, so, fortunately, the small players are showing the big ones that acting in a sustainable way equals quality and design. How To Be a Fashion Revolutionist All Year Long?